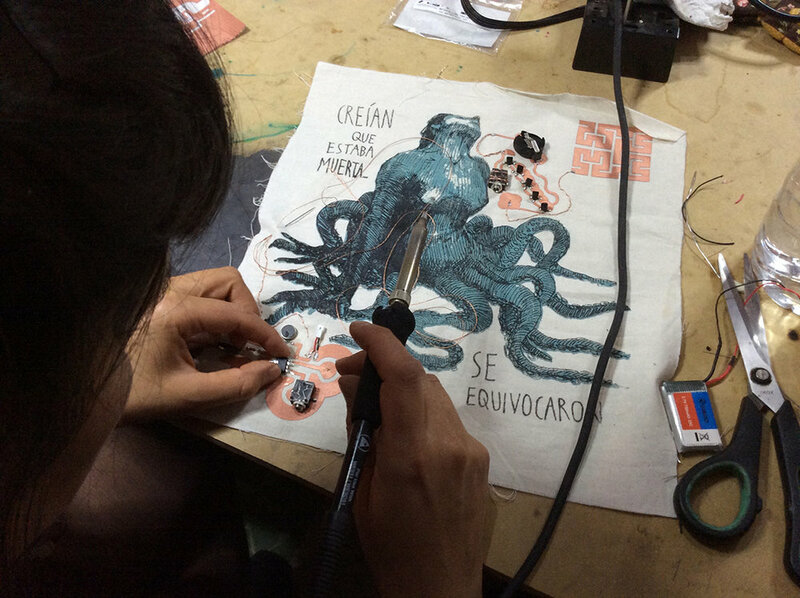 This workshop encompasses the idea of intersecting science and art through e-textiles and wearables, by creating handmade technological artifacts that can sense electromagnetic fields. After a brief presentation of reference projects and technologies that would be used, the participants will experiment with two different circuits. One acts as an amplifier that can pick up LF transmissions and make them audible. And the other, an ATtiny85-based detector, provides sonic, haptic and visual feedback of the picked-up interference. Furthermore, the participants will explore the concept of fractal antennas and will create their personalised wearable EMF detectors. Electromagnetic fields are everywhere and this workshop provides the basic tools for sensing the invisible universe that surrounds us by providing sonic, haptic and visual feedback on our bodies. The wearable detectors that will be produced at the workshop can be used in a number of ways - as an open-source tool to explore the city’s invisible landscape, as an audiovisual performance interface or as a way to collect EMF data that can afterwards be used for further analysis and experiments (e.g. visualisation or signification). Workshop Instructor: Afroditi Psarra, PhD (Athens, 1982) is a multidisciplinary artist working with e-textiles, diy electronics and sound. Her artistic interest focuses on concepts such as the body as an interface, contemporary handicrafts and folk tradition, pop iconography, retrofuturistic aesthetics and the role of women in contemporary culture. Her artworks include a wide variety of media and techniques that extend from embroidery, soft circuits, hacking and creative coding, to interactive installations and sound performances. She holds a PhD in Image, Technology and Design from the Complutense University of Madrid. Her academic research Cyberpunk and New Media Art focuses on the merge of science fiction ideas and concepts with performative and digital practices, and offers a philosophical, sociological and aesthetic analysis of the influence of new technologies in the contemporary artistic process.